1995: Looking Back At STAR WARS: DARK FORCES | Warped Factor - Words in the Key of Geek. If you ever, even just casually, played video games in the 1990s then chances are you played Doom. The first person shooter was all the rage at the time and a multitude of clone style games appeared on a variety of platforms. Out of all them Star Wars: Dark Forces is still the stand-out one for me. 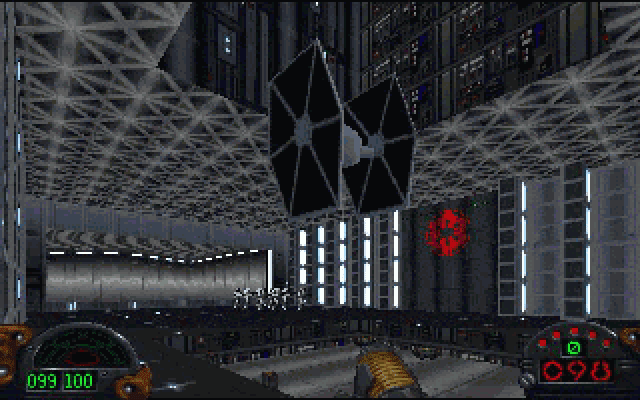 Initially released on February 28th 1995 on the PC and ported to a variety of platforms, Star Wars: Dark Forces is set around the time of the Original Trilogy, with the evil Galactic Empire working on a project that might win them the war. You take on the role of the Han Solo-ish Kyle Katarn, a former Imperial Stormtrooper and agent, now a mercenary for hire in the service of the Rebel Alliance. 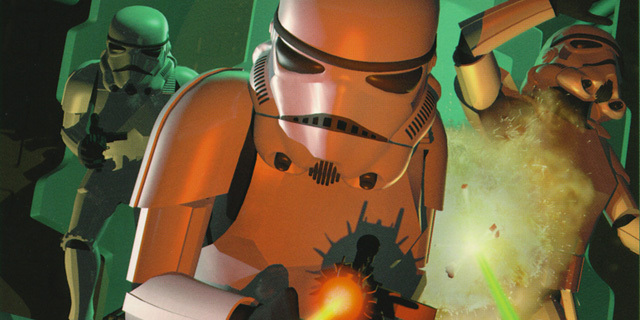 At a time when it was considered novel if the character you control could look up and down in a game, the always ahead of the curve LucasArts added the in-game ability to jump and crouch! A huge step forward in this style of gaming, and quickly adopted into so many other titles. However unlike many of the first person shooters and Doom-clones Dark Forces really tests you mentally, with some of the puzzles being infuriatingly tricky, but the challenge is such that it's so addictive you can't help but keep coming back for more. Unlike Doom, which obviously sets out to be scary, Dark Forces is subtler. Yet in many parts of the game the atmosphere is quite dark and can be shocking as the enemies leap out attempting to kill you. The environments vary from lush and beautiful, to deliberately barren and ugly, and all are fun to explore. The story line is taunt and cohesive, and again unlike Doom, there's a good almost realistic plot combined with the perfect anti-hero. Weaponry is diverse, with a cool arsenal ranging from heavy rocket launchers to the horribly in-accurate storm trooper blasters. And don't forget thermal detonators. 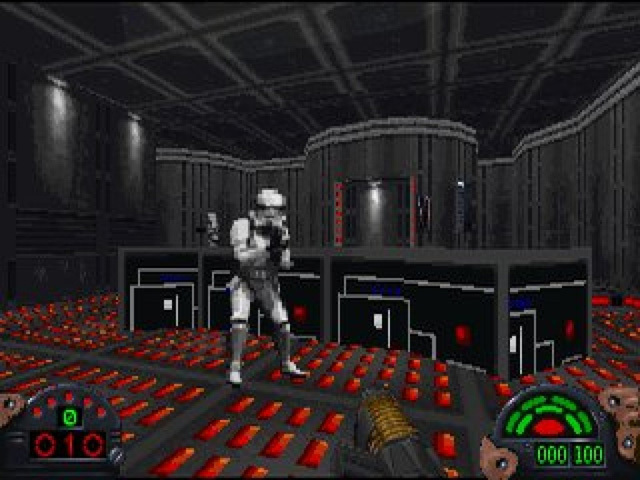 As a single player first person shooter, Star Wars: Dark Forces was unmatched for its time (although I accept some would argue this point). Another tick in the plus column, although somewhat dating the title more than the gameplay itself, are the cut-scenes. You get to see Darth Vader, Original Trilogy Imperial Stormtroopers and go one-on-one with Boba Fett! Plus the midi arrangement of John Williams famous Star Wars score sounds great, and adds to that superb atmosphere. Star Wars: Dark Forces was hugely successful and was followed in 1997 by a sequel, Star Wars: Jedi Knight: Dark Forces II. This title then spawned an entire series of Jedi Knight games, all focusing on the continuing exploits of Kyle Katarn, but I still think the first one was the best. 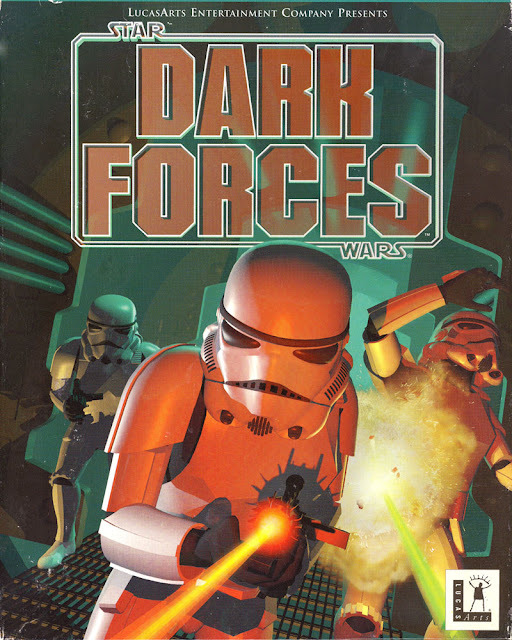 One thing Dark Forces was missing is a multi-player mode, if ti had one then I think that would've made the game just perfect, but even now, more than twenty years since its release, it's a force of a game to be reckoned with. And it's back! As on April 29th this year Star Wars: Dark Forces was released on the PlayStation Network, and made available to play on both PlayStation 3, and PlayStation Portable. So if you want to try and win the Star of Alderaan from Mon Mothma you don't have to dig out an old dusty, scratched disk to do so.